Yes, anyone who gets married also gets an automatic prenup: The law. The law in Florida prescribes what happens in the event of divorce. But you may not be happy with that automatic prenup. In fact, it may be best that you create your own prenup. Section 61.075 of the Florida Statutes tells you that almost anything acquired during the marriage will be the property of both parties. It generally does not matter who purchased an item or earned the income; both spouses are entitled to it. So, for an example, if a spouse forms and grows a business during the marriage, that business is considered marital property and both spouses are entitled to a portion of the company in a divorce. Similarly, Florida’s laws of equitable distribution inform that both parties are responsible for any debt incurred during the marriage. This is regardless of who actually contracted for the debt. Accordingly, if one spouse racks up tens of thousands of dollars of credit card or gambling debt without the other spouse knowing, both spouses are equally liable for that debt if the marriage falls apart. Florida Statutes section 61.08 addresses alimony. 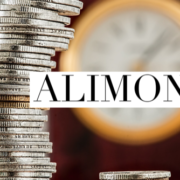 It states that if one person has a need for alimony, and the other spouse has the ability to pay, then there very well may be an alimony award. There are certain factors that come into consideration. Two factors are the standard of living during the marriage and the contributions (both financial and non-financial) of each spouse to the marriage. So, if you are getting married you can fall back on the law, on the automatic prenuptial agreement between you, your spouse, and the State of Florida. Alternatively, you can create your own rules. You can agree to a premarital contract with your fiance. This agreement can outline how certain assets, such as a home, will be joint, while other assets, such your business, will remain separate property. It can inform how debts will be counted as marital or non-marital. And it can help everyone agree to the circumstances under which spousal support or separate maintenance will come into play. By the way, if you are going to get a prenup agreement, consider reaching the agreement via collaborative practice. In collaborative practice, you and your fiance will each have your own attorneys to advise you. The attorneys will be specially trained to treat you and your fiance as teammates rather than adversaries. Other professionals, such as financial professionals and facilitators with background in family communications, may also be used. This is your best bet to achieve a comprehensive, fair, and enforceable prenup. Also know that if you are already married, it is not too late. You and your spouse can come to a postnuptial agreement. It may be that the prenuptial or postnuptial agreement becomes the most useless document that you ever help draft. But isn’t it better to shape your own understanding rather than rely on the prenuptial agreement created by bureaucrats in Tallahassee? Contact A Prenup Lawyer Now!